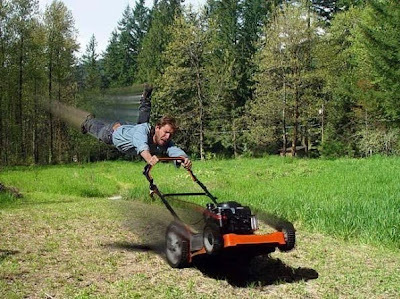 Happy weekend traders! I hope you're all enjoying some much deserved down time this weekend, but if you need a break from your usual chores, here are a few things to keep an eye on going into Monday. I've been digging up a few things that might be of interest, both bullish and bearish for your review before we hit the ground running Monday morning. I'll put up a few charts, and in the spirit of saving space up here, I'm just going to link the others. What I've been looking at are the non-confirming major sectors in relation to the new high set by SPX/SPY this last week. Some notables that did set new highs include RTH, RKH, XLE, BKX, and RIFIN for you FAS/FAZ traders. More bellweathers that failed to achieve either a double top or new high include: TRAN, XLB, XLU, XHB and one you may have never heard of before- QGRI. I had never heard of it myself until a few weeks ago, and was reminded to look at it today after viewing a trading video earlier. 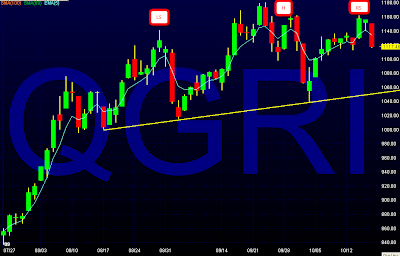 QGRI is an OMX index, (NASDAQ) and the link to see the holdings can be found here. It might be a good idea to keep an eye on the individual holding included in the days and weeks ahead. These are the TARP recipients, and it's too bad they didn't name this index $JOKE, but there you have it. 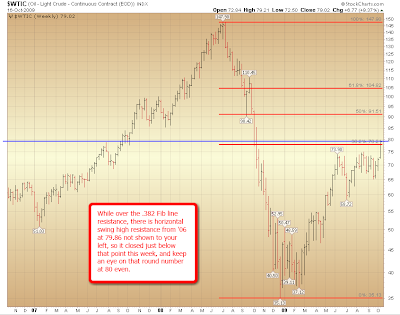 Also, if you missed Alpha's 15 min BKX chart on Friday, here's the link to see a potential H&S right at the neckline. BKX 15 Min chart. Good catch, Alpha! The combination of Alpha's BKX chart with QGCI, and WFC earnings on Wednesday could be giving us a hint of something up the road this week. IYR. A few things going on in this chart of interest. 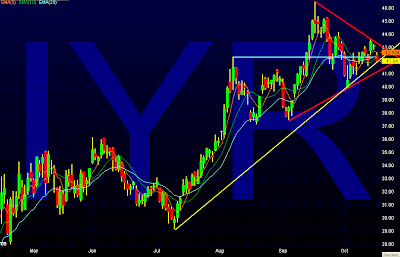 For those wanting to bite the bullet and start trading the widow maker, SRS, you'll see IYR closed under horizontal support, but is resting on longer term trend line support, and still within a triangle pattern. So... take heed and be cautious. XLE was on a tear this week, as we watched both oil and coal show some good gains. 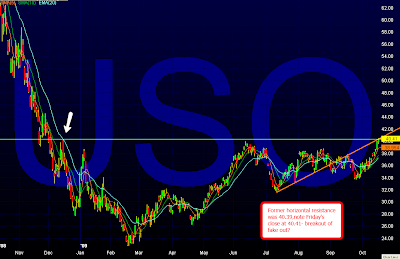 While I don't like to chart USO to follow the moves on oil, here's my chart, and below a chart on $WTIC- my preference. KOL put in new highs on the 15th, so it's still worth a very good watch going forward, but check your individual players carefully, as ACI was one of the few that was able to hold those gains on Friday. See some comparison charts here. Oh.. one more thing I wanted to share in keeping with a relaxing music filled weekend. I am a huge fan of Flamenco guitar, and particularly the talent of Paco de Lucia, but this has the added talent of John McLaughlin and Al Di Meola. If we can approach trading with the passion and talent they have, well... look out! I'm reading: WYSIWYG Weekend $$Tweet this!